Aissshhhh! As I muttered the expression I used when irritated, often use it when I’m alone. But yesterday, someone heard the word. “Problema miss?”, as this young lad approached me. Startled upon hearing his voice, I blurted out “Unfriend or unfollow?” as I turned around. He smiled and said “Facebook ba?” I nodded and he said “Just click unfollow lang” as he passes by waving goodbye. It’s rude to unfriend someone who’s on your friends list for several years. Just because you’re seeing all those negative post, and news about negative comments regarding our President makes me want to remove them on my friends list. If only I can filter your post, so I only get to see and read the positive and informative postings. Sad to say Facebook only has the option of unfriend and unfollow. Unfollow for me it means I still want you to be on my friends list, but not on my timeline. Seeing none of your post as it doesn’t interest me anymore. Unfriending someone on your list of friends, for me it means I want you out of my social life. Cutting of communication through interactive social media only. Since I did not include you on the blocked list, it means you are still welcome to contact me but not through Facebook. How about you? Click on unfollow or unfriend? 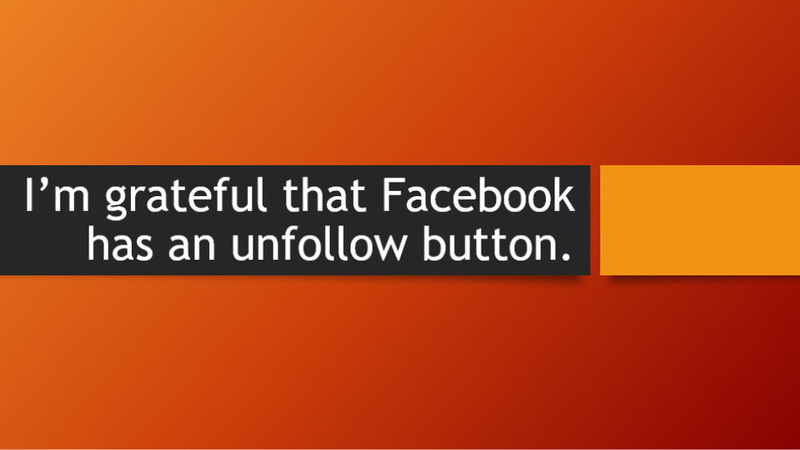 Did you happen to at some point in your life want to unfollow or unfriend someone? Before hitting on the ‘unfriend button’ please take into consideration that the person you unfriended might not add you up if you want to be friends again. You’ve hurt the person’s feelings. Even if you’re itching to click on that unfriend button. Think twice or thrice. Do I need to? Seriously am I sure? Am I really sure? If not, then don’t. It might save you from having a hater or an anti-fan. Just because you want to clean up your timeline just as I wanted mine to be all positive threads doesn’t mean unfriending is the only option. Just hit unfollow button instead. This photo was created via PowerPoint and converted to jpg. Kindly ask permission before copying this photo. Thanks. ** The conversation above happens to be in my local dialect. I did not translate it since the conversation is more of english.